As you could guess, we like the Mortal Kombat universe. 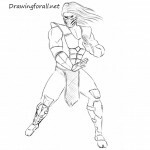 On DrawingForAll you can find drawing tutorials about Scorpion, Sub-Zero, Raiden and other characters of Mortal Kombat. 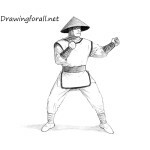 And in today’s drawing tutorial we will show you how to draw Sonya Blade – one of the most famous and memorable female fighters from computer games. 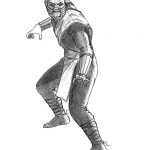 By the way, Sonia appeared in the very first part of the game Mortal Kombat. 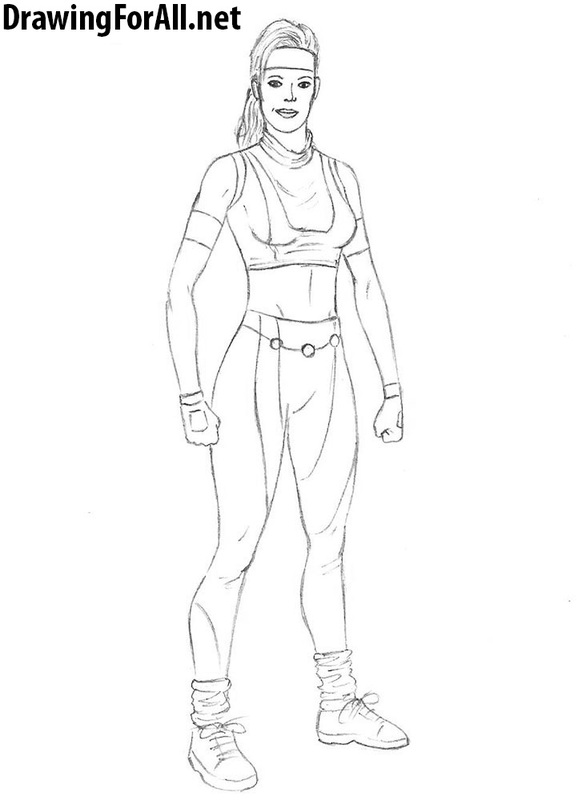 And today we will draw Sonya Blade in one of her classic appearances, namely as she was dressed in Mortal Kombat 3. 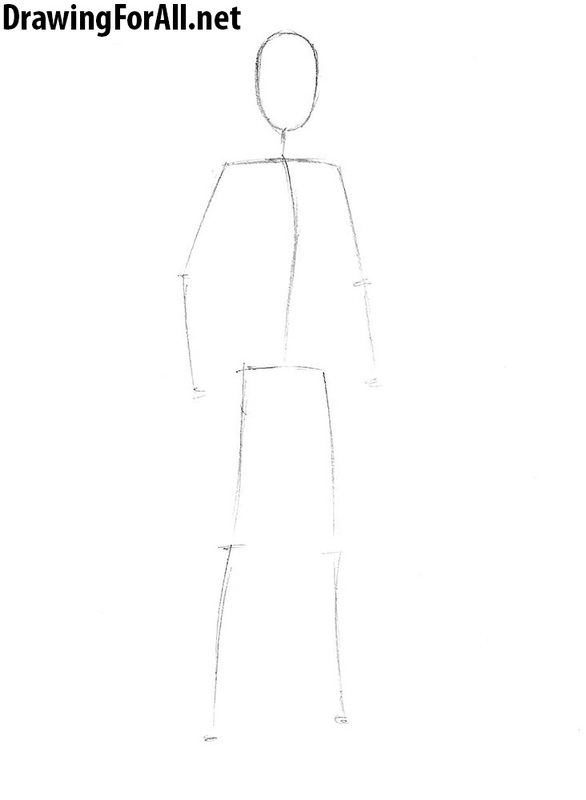 We begin, as always, with a stickman. Despite the fact that Sonia is a cool fighter, she is very feminine physique. Therefore, all the rules of drawing the female body herein may be applied. Take a look at our tutorial dedicated to how to draw a girl – almost everything mentioned in the first stage, can be applied here. So, first we draw the head of the “skeleton” of Sonya Blade, which is very similar to an oval or inverted egg. Then consistently sketch out the lines of the body, such as neck, shoulders, spine, arms and legs. Then consistently sketch out the lines of the body, such as neck, shoulders, spine, arms and legs. The second stage is also similar to other drawing lessons of girls who have been on our website. 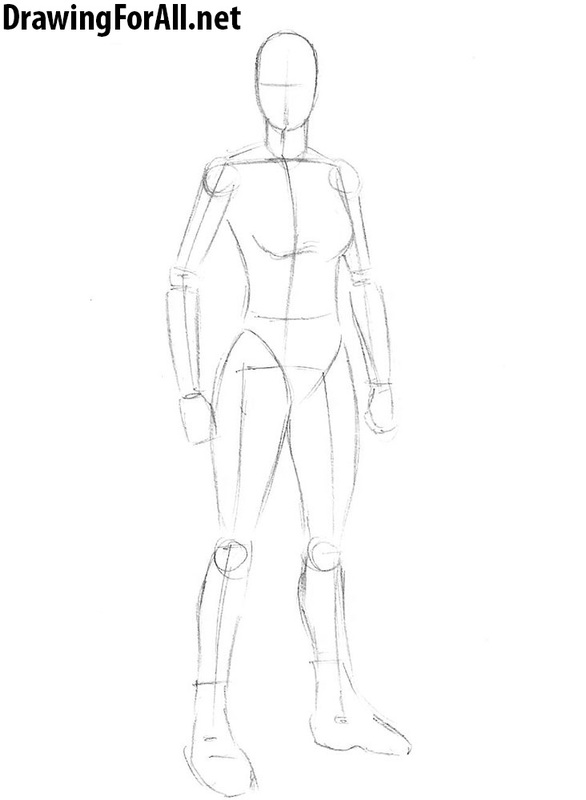 Draw the silhouette in the direction from the head to the feet, but the first we will work with her head. Draw a pair of perpendicular lines on the head – vertical line will indicate facial symmetry, and the horizontal is line of the eyes. Sketch out the outlines of the torso, that similar to hourglass. Then outline the arms, using smooth and narrow cylinders. Note that the arms should not be massive and inflated. Sketch out the shoulders, elbows and hands. 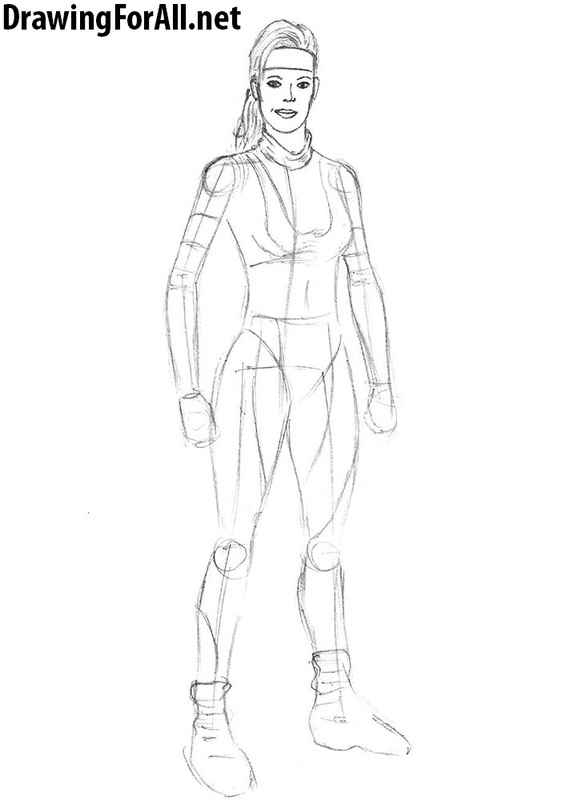 A short, but very important step in the tutorial on how to draw Sonya Blade. Here it is necessary to draw the strap for hair, hair themselves (here we draw only the top of hair, the bottom of hair we will draw later), and the main features of the face. Using the horisontal line from the previous step sketch out the eyes by a pair of lines. Below the eyes sketch out the nose and mouth. At the sides of the head sketch out the ears. Also in this step outline the collar. Now we finish the facial features of Sonya Blade. Draw the almond-shaped eyes and pupils inside. Above the eyes draw the thin and curved brows. Below we draw the nose, that consists of very simple lines. Then draw the mouth, which is very simple to draw. First draw the line of the mouth, then line of the upper lip, and lower lip, using a curved line. At the end of this step circle the shape of the face as in our example, and draw the lines of the hair (that should be drawn from the roots to the tips). This step should be drawn, using very light and smooth lines, without strong pressure on the pencil (as we did in the early stages). Sketch out gloves and bandages on the shoulders, and then – smooth contours and curved pattern on the shirt, then – the pattern on the pants and socks with folds. Incidentally, a similar pattern you can see on pants of Jax. 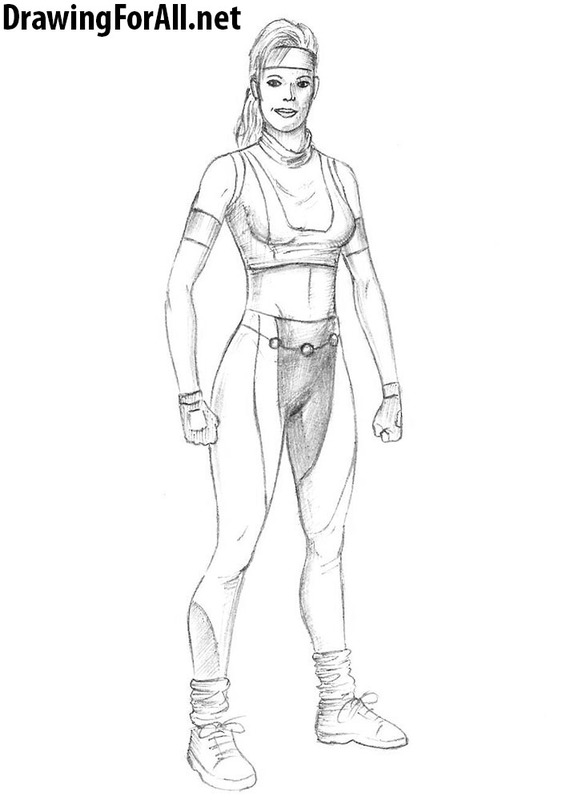 Draw the torso of Sonya Blade – circle the contours of shirts, outline the chest, and the pattern on the folds of fabric. Circle the waist, erase the extra strokes from the previous steps, and draw the lines of the abdominals. Then erase the extra lines from the arms and also circle them. Do not forget to draw a few lines of muscles on the arms. Draw the belt of Sonya – it consists of a straight line and a few circles. Draw the pattern in the central part of the pants, the soles and laces. Now we determine the source of light and add shadows. Light falls straight from the top, it means, that we will add shadows predominantly at the lower parts of the body of Sonya Blade. Note, that we use simple hatching to draw the shadows. In the places where the shadow is thicker and darker we use another layer of hatching or press a little harder on the pencil. 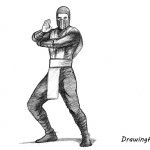 In this drawing tutorial we once again drew a character from Mortal Kombat, known from the very first game of the series – Sonya Blade. Stay with us, we will do a lot more tough lessons!